Portraits and landscapes at their prime. Introducing the latest NIKKOR prime lens worthy of wearing the coveted NIKKOR gold ring. The AF-S NIKKOR 28mm f/1.4E ED is a dynamo at capturing beautifully rich and detailed still images and movies in any light. On FX-format cameras, its fixed 28mm focal length gives your shots a natural, true-to-memory feel. Its fast maximum aperture of f/1.4 delivers beautiful depth of field with exquisite bokeh characteristics any time of the day or night, and its durable, agile design makes it a workhorse for the most passionate shooters. With a 28mm angle of view, the AF-S NIKKOR 28mm f/1.4E ED is the perfect lens for reproducing naturally vast spaces with a depth just as you see it. Compositions and perspectives will appear natural and just as you intended, making the AF-S NIKKOR 28mm f/1.4E ED a thrilling lens to spend the day (and night) with, capturing portraits, landscapes, architecture and interiors with high resolution and outstanding definition. The AF-S NIKKOR 28mm f/1.4E ED delivers peak performance from Nikon DSLRs, especially the latest generation of high-resolution cameras. Expect stunning sharpness across the entire frame regardless of aperture setting and minimal distortion. Use its large and beautiful bokeh to soften backgrounds and accentuate foreground/background relationships. 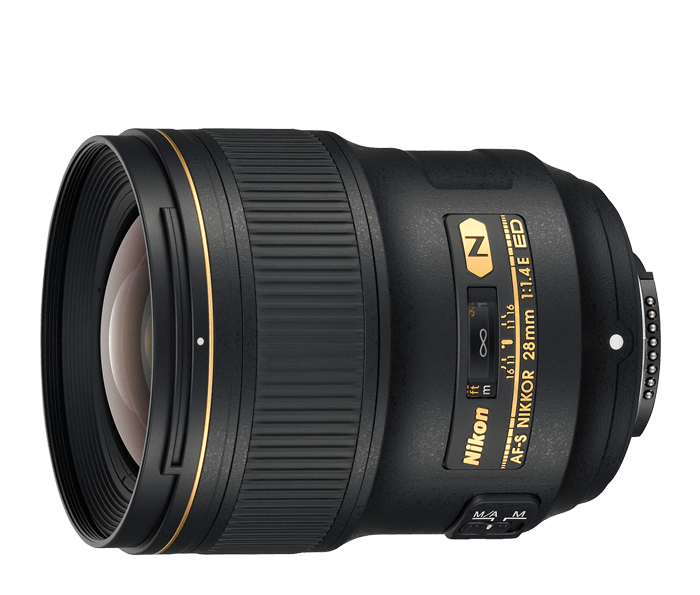 The AF-S NIKKOR 28mm f/1.4E ED lens takes optical design to the next level. Two ED glass elements and three Aspherical (AS) lens elements combat chromatic aberration and color fringing for stunning sharpness and contrast. Nano Crystal Coat (N) cuts through ghosting and flare for outstanding backlight tolerance. Expect consistent, brilliant photos and videos. Despite its incredible imaging power, the AF-S NIKKOR 28mm f/1.4E ED is simply a tool used to realize your creative vision. In order to provide a lifetime of exceptional photography, every effort was made to ensure dependability and worry-free functionality, regardless of weather conditions or harsh environments. Fluorine Coat effectively repels dust and drips while all movable parts are sealed for further protection from the elements. To provide smooth, highly accurate focusing with comfortable operation, focus ring operation was refined for optimum torque and usability while manually focusing.